To get your free voucher please come into the Tourist Information Centre (during opening hours, 10am – 4pm, Mon-Sat). Your passengers are made very welcome in the TIC and get a free map of the town. Self-guided tour leaflets are available for only 20p. Please do not attempt to drive down Bell Street as this is too narrow for coaches – please use Bleke Street. COACH PARK ADDRESS: Bell Street Car Park 2 Spaces plus drop-off bay. entering car park on left from Bleke Street. Free voucher for coffee from TIC. MARKET DETAILS: Market Day every Thursday. Farmers Market first Saturday of the month. Antiques & Flea Market every Tuesday. 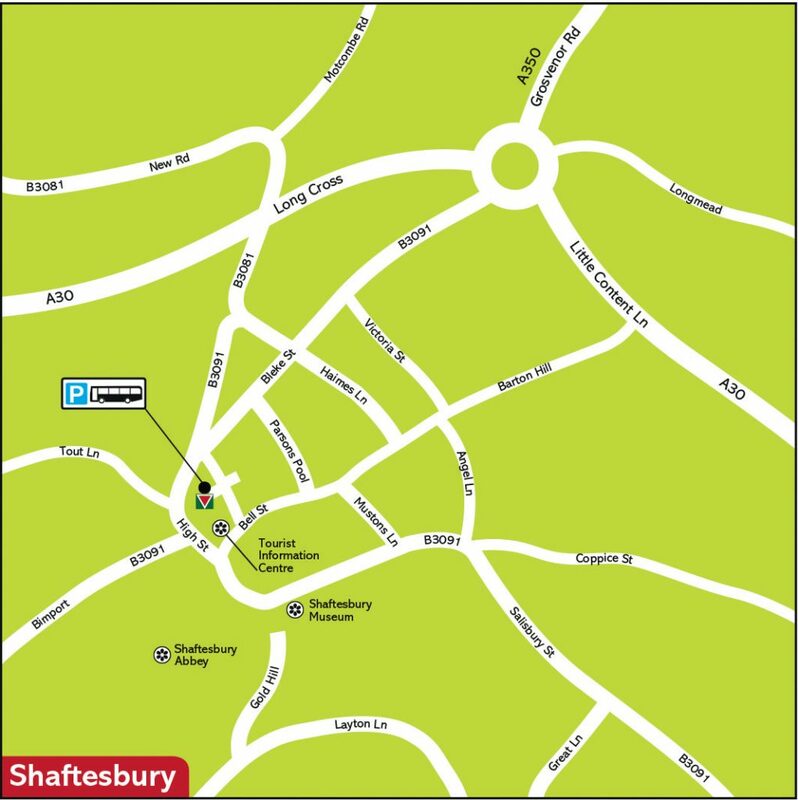 SHOPPING HIGHLIGHTS: Shaftesbury has a wide selection of quality cafes, pubs and restaurants and proudly boasts a High Street filled with independent shops offering everything you need from gifts to clothes, home furnishings to local produce. POINTS OF INTEREST: Gold Hill, made famous by the Hovis advert, is an iconic image of England with magnificent views over the Blackmore Vale. The Saxon roots can be uncovered at Shaftesbury Abbey, founded by King Alfred, and the Gold Hill Museum. Wardour Castle is a few miles to the east. NOTES: COACH FRIENDLY TOWN OF THE YEAR 2011 and also Finalist in 2012. At over 750 feet, it is the second highest market town in the country with sweeping views in all directions. It is called ‘Shaston’ in Thomas Hardy novels.